A numerical scheme for a class of singularly perturbed parabolic partial differential equation with the time delay on a rectangular domain in the x–t plane is constructed. The presence of the perturbation parameter in the second-order space derivative gives rise to parabolic boundary layer(s) on one (or both) of the lateral side(s) of the rectangle. 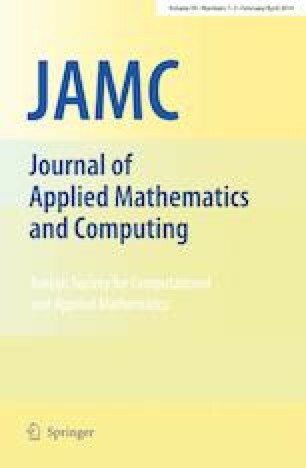 Thus the classical numerical methods on the uniform mesh are inadequate and fail to give good accuracy and results in large oscillations as the perturbation parameter approaches zero. To overcome this drawback a numerical method comprising the Crank–Nicolson finite difference method consisting of a midpoint upwind finite difference scheme on a fitted piecewise-uniform mesh of \(N\times M\) elements condensing in the boundary layer region is constructed. A priori explicit bounds on the solution of the problem and its derivatives which are useful for the error analysis of the numerical method are established. To establish the parameter-uniform convergence of the proposed method an extensive amount of analysis is carried out. It is shown that the proposed difference scheme is second-order accurate in the temporal direction and the first-order (up to a logarithmic factor) accurate in the spatial direction. To validate the theoretical results, the method is applied to two test problems. The performance of the method is demonstrated by calculating the maximum absolute errors and experimental orders of convergence. Since the exact solutions of the test problems are not known, the maximum absolute errors are obtained by using double mesh principle. The numerical results show that the proposed method is simply applicable, accurate, efficient and robust. The authors would like to thank the anonymous referees for their helpful comments that improved the quality of this paper.